I seem to be a little lost for words today. I could talk about the weather, which is cold and a little overcast. 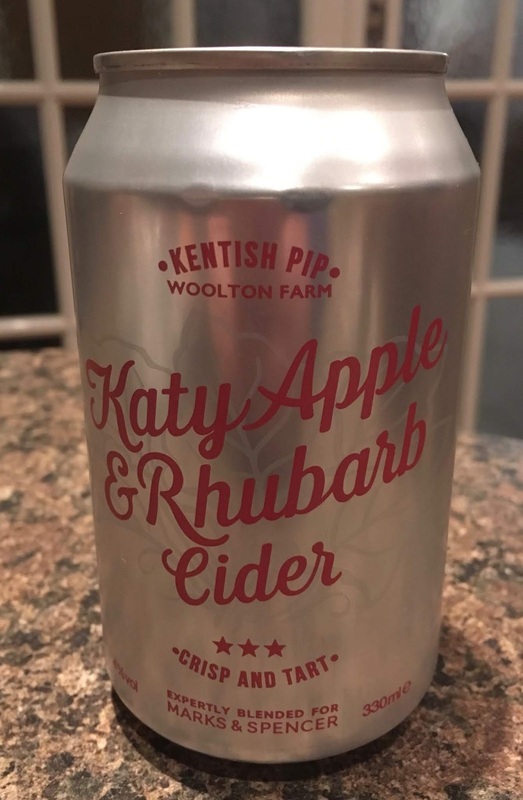 Not great for cider, such as this Spring feeling Katy Apple & Rhubarb Cider from the Woollen Farm, in Kent. There was not much heat in the outside pool whilst I was swimming after my weights at the gym today. I gave a little chuckle when the sun poked out of the clouds for a moment and a mom and dad with toddlers jumped in and then promptly jumped out again. A day out at Ludlow Castle yesterday had left me in so much pain in my knee that I didn't think I'd be able to do any weights today. I even felt a little nauseous from it whilst driving to the gym. I push myself. You have to. Without discipline anyone who is going through any rehabilitation will tell you that you won't stand a chance. I got up to 30kg for two sets on the Seated Leg Curl for my hamstrings without pain. I don't even remember a time I reached that level before both operations on my knee over the last four years. I just had to catch myself for a while. It's difficult to control my emotions sometimes. Even writing this now. I managed to do all my other weights and cardio, even finishing with a fairly brisk walk on a machine after my physiotherapist had encouraged me to do so a couple of days ago. I didn't have to catch myself then though. It was the first time I'd ever been on a walking machine. It'll probably take sometime to get used to the sensation, as it feels like I'm walking backwards…! So, what have I got here? Cider, yes… Katy Apple & Rhubarb Cider. I do like cider, of course, I prefer ale, but the amount of time I spend in the sauna these days, I do often need something refreshing to cool me down. I do like rhubarb also. We had a few rhubarb plants at the last house. Each year they would yield one pudding for three people and one glass of rhubarb juice, which I always drank. Not much, you may think, but it all tasted really good! Made with Katy apple juice, Timperley Early and Queen Victoria Rhubarb this 4% volume lightly sparkling cider has a slightly pinkish glow to it on pouring. The cider apple shines through in the aroma first with a sweetness from the rhubarb behind it. Gosh this Katy Apple & Rhubarb Cider is crisp. It's got a knife edge sourness from the cider apple to start with followed by a tart sweetness from the rhubarb into the aftertaste. Mmm… I'll kick back and enjoy this cider for a while, and hopefully Cinabar will treat me to another few cans when the lady's tennis starts to get interesting!